Open up Reaper and add a track. Hover your mouse over this button and right click. 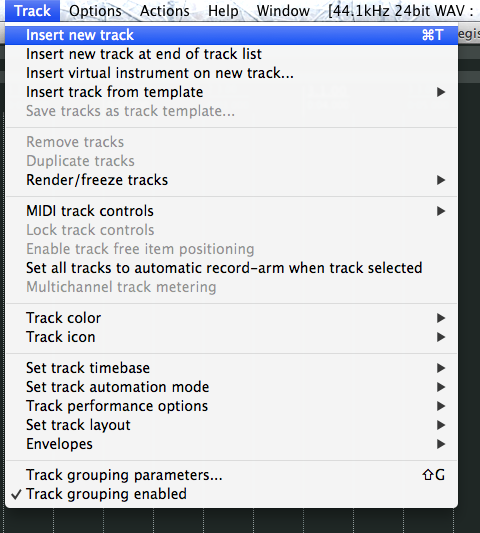 For now leave – ‘Record: Input (audio or MIDI)’ as it is. The option we are looking at is the third section down. When you hover your mouse over the ‘Input:MIDI’ option it will open up your devices that are available. Hovering over your device of choice, in this case my, ‘Arturia Minlab’ you can then choose either, ‘All Channels’ or choose from any of 16 channels. Right click on the dull red button again and check that everything is correct. If everything went accordingly you should now have two ‘ticks’. One against ‘Input: Midi’ and one against your device. 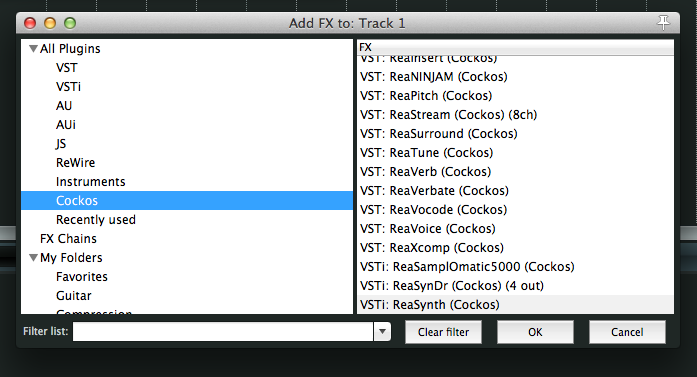 To get your keyboard to make a sound you will need to ‘arm’ the track. Click on the little dull red button. It should now change colour. Press the keyboard, try and play something. do you see any activity? Yes? Then we should be good to go. If there is no activity then you will need to check everything, including your midi device setup. So ok, we have activity but no sound. This is where it get’s interesting. You need what is called a VST instrument, or AU instrument installed. If you have none of these then you should take a look at the following tutorial. For now we can use one that already comes installed with Reaper. 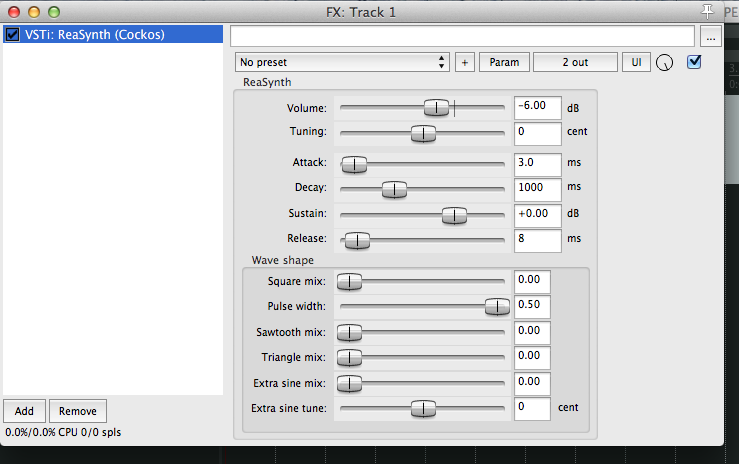 On your track, click on the ‘FX’ button. 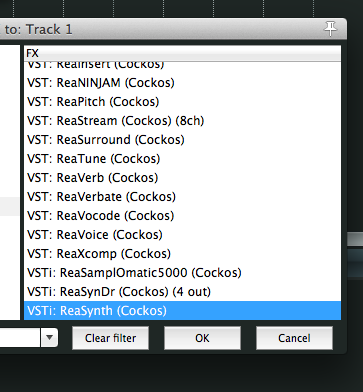 On the left side of the FX browser click ‘Cockos’ – this is the folder where Reapers own plugins live. This is a simple sounding instrument that can be quite useful if you ever get time to tinker – for now we are using it to get you used to setting up midi and recording. Double click on ‘ReaSynth’ and you will get the window below. Now press a key on your midi keyboard. It’s very likely that the answer is still no. We need to do one more thing. Underneath ‘ar’ and to the left is a button that has what looks like a speaker on it. Press a key on you midi device(keyboard). Hopefully the answer is yes – if not then something needs to be checked. So there you are – midi is setup. 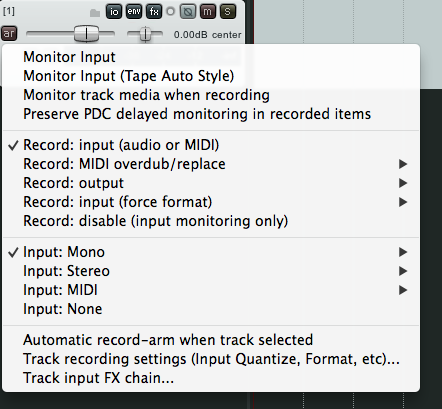 You can now start recording – there are more monitoring options – and there are also editing options once you have recorded but they are separate tutorials. I’ll update with links to more tutorials regarding Audio and recording as and when they are written.